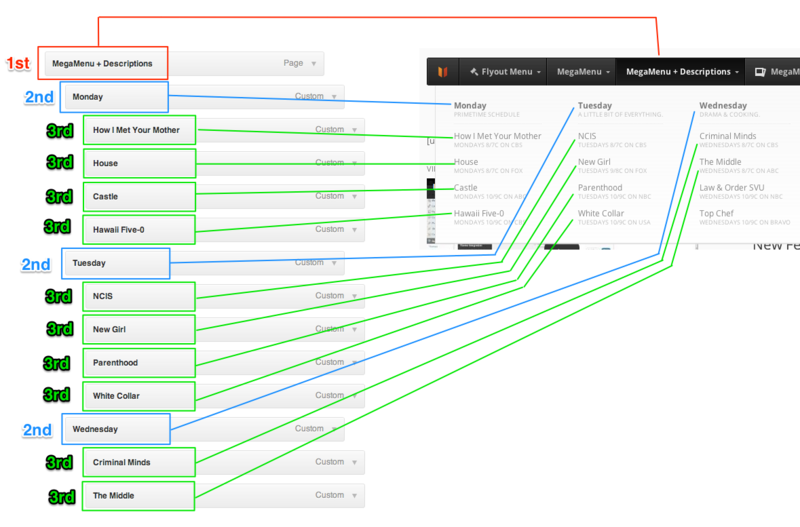 It’s critical to understand how menu structures created in the Appearance > Menus screen map to UberMenu Layouts. Here’s a diagram showing how first, second, and third level menu items are organized into a mega menu layout. Laid out horizontally, left to right. Always visible on the menu bar. vertically-aligned menu, these items are aligned in a column. The top level menu items are always visible. Laid out horizontally, left to right, within a submenu. Act as submenu Column Headers. with the second level menu items as the headers at the top of each column. Laid out vertically, top to bottom. Listed below their second level item header. categories. Sibling items are aligned vertically in list-fashion below their column headers (second level menu items).